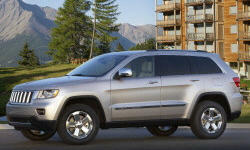 Why the 2011 Jeep Grand Cherokee? The new Jeep has come a log ways from the 2006 SRT8 I used to own. Much more comfortable and quiet. Perfect for my growing family of 4 and my 3 dogs. I have the Quadra lift and love it. The 4x4 performance in inclement weather is superior to anything I have owned in the past (come from a long background of 4x4 trucks). The handling makes me feel confident and safe. The MDS Hemi is outstanding. I can cruise at 80mph and knock down 19mpg....at the same time, passing and entering a highway is an easy process with the power available. The towing capabilities are a wonderful plus since I do tow occasionally. Everyone who rides in this vehicle comments on how smooth the ride is. I have the 18" wheels (Offroad package II) and this helps. The shorter wheel base does introduce some bumps but that is to be expected. Why Not the 2011 Jeep Grand Cherokee? They are harder than I would like. I came from an F150 with the luxury package and the seats were amazing, these sears are hard and could be improved upon by being softer. The NAV is better than the 06 but not by much. The Garmin system available will likely fix this. The sound quality is less than I expected, the F150 with sound package was lights years better than this. There were none LOL, but, I guess that is what I get buying a new model year so early in its release.